Popped in to the Kent Family History Fair today as it was just down the road. Had a browse through some postcards, having been inspired by John Gasson at The Wandering Genealogist, and his postcard collecting. I lasted about 15 minutes, and didn’t find anything I really wanted to purchase. I think I’d like to have a little shopping list next time. What I did buy was a CD I’d been eyeing up online – the Kent Family History Society‘s Poor-law Records for Mid-Kent, which contains indexes of settlement certificates, bastardy bonds, removal and settlement examinations, etc, chiefly from the Poor Law Union areas of Gravesend & Milton, Hoo, Strood (or North Aylesford), Milton, Hollingbourne, Maidstone, Malling, Tonbridge, Cranbrook and Dartford (for parishes where records are held at Maidstone or Medway). Happily I found a mention of the ancestor I was looking for! Now that I know the records are there, I can go take a look at the original documents, and also check the parish vestry minutes for the time period, see if there are any other mentions. The other item I bought was a CD from the bargain box – Pigot’s 1840 Directory for Kent. From a quick look, the villages I’m particularly interested in aren’t mentioned, but hopefully I’ll find some use for it. Today was a beautiful sunny day (for a change) and just the day to take a trip down to Yalding, Henry Richard Florey’s birthplace. I’ve driven through it several times, but never walked around. 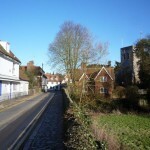 From Twyford Bridge, looking towards the High Street, with St Peter and Paul’s Church on the right. Wikipedia, “Yalding”, article (http://en.wikipedia.org/wiki/Yalding : accessed 08 Jan 2011). I was still on the hunt for Henry Richard Florey’s dad. My next step was to check the Yalding parish records to see if the priest/curate had made any additional notes on the register that didn’t make it into FamilySearch. (Else Churchill, Genealogist at the Society of Genealogists, gave a great talk about this at Who Do You Think You Are? Live last year.) Even a note of “illegitimate” would be useful! I don’t know where to find them. So it’s a slow (but very interesting) process of discovery. I had looked at Phillimore’s Atlas and Index of Parish Registers in a local library and checked where copies of the Yalding parish registers were held for the years I needed – Centre for Kentish Studies in Maidstone [now the Kent History and Library Centre]. Using the search facility on Access to Archives on the National Archives website, [now included in their Disovery catalogue] I could also check exactly what I needed to ask for at the Centre. Looking back over the catalogue now, I wish I’d spent more time preparing beforehand, before I rushed in. However, the staff at the Centre were great, showed me where things were and set me up with a microfilm reader, and away I went. Located Henry’s baptism record very quickly – no new information (I thought), but I made a note of the details and took a print of it. Next I went on to Wateringbury records – I was trying to find any mention of the Elizabeth Florey household from the 1841 census. I checked the settlement orders (removal into and out of Wateringbury) and the overseers rates from 1838 to 1843 (I realise now it would be unlikely for my household to be mentioned in here, but you live and learn). No joy, but there are plenty more records to check – I just need to pick the right ones! And now I’ve been into the Centre, it will much easier to go again. I also now have a Reader’s Card. 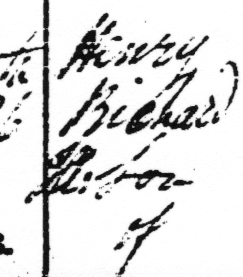 When I came to scan the printout of Henry’s baptism record, I looked quite closely at the handwriting, thinking it was pretty messy with the “scribble” and cross out. 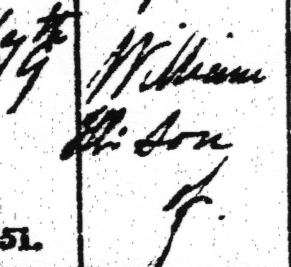 Then I looked a bit more closely… could that “scribble” just before “Son of” be “Ill.”, abbreviation for “Illegitimate”? If only I had discovered this at the Centre, so I could check other records. But wait! Further down the page, just three records below Henry’s, there was the same “scribble”, and it was another record where no father was listed! From that, it looks pretty likely to me that Henry was illegitimate. Disclaimer: Phillimore’s Atlas and Index of Parish Registers is authored/edited by Cecil R. Humphery-Smith, who is the founder and former Principal of the Institute of Heraldic and Genealogical Studies, through which I am currently studying. Or should be studying, if I wasn’t spending so much time working on this blog. I mentioned in yesterday’s post that I had found James Florey and Elizabeth Jane Knott’s marriage, and their daughter Jane Elizabeth’s baptism, in FamilySearch. Of course, what I really wanted to do was view the records in the parish registers. 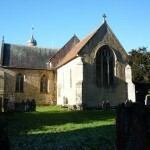 Fortunately, Frindsbury, where James and Elizabeth’s marriage took place, and the parish of St Margaret where Jane was baptised, both lie within the district of Medway. And the Medway Council provide an enormous boon to family and local historians – images of real live actual records, online! Medway Ancestors is Medway Council’s project to publish images of the original parish registers in its custody on the Medway Archives web site CityArk. 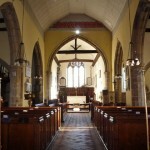 The registers are held on deposit from the local parish churches and cover the Rochester Archdeaconry area, extending from Dartford and Gravesend in the west to Rainham in the east and focusing on the Medway Towns. 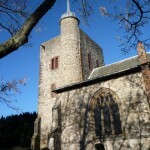 The project has been made possible by a grant of £49,500.00 by the Heritage Lottery Fund under the Your Heritage scheme. All Saints Parish (Frindsbury, Kent, England), Register of Marriages 1813-1822 [P150/1/10], p138, James Florey and Elizabeth Jane Knott, 05 Mar 1820; digital images, Medway CityArk (http://cityark.medway.gov.uk/ : accessed 23 Nov 2010). St Margaret Parish (Rochester, Kent, England), Register of Baptisms 1813-1832 [P305/1/7], p 189, Jane Elizabeth Flora, 02 Jan 1825; digital images, Medway CityArk (http://cityark.medway.gov.uk/ : accessed 30 Dec 2010). 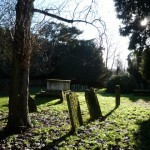 For lists of parishes covered and tips on how to use the site, check out Medway Ancestors. 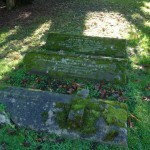 Henry Richard Florey is my great great grandfather on my mother’s side. I got the tip-off from his son’s marriage certificate.1 Henry’s son (Henry John Forrest) had married in Auckland, New Zealand in 1885, but he’d been born in Chatham, England around 1862. So where did his father Henry Richard come from, and who were his parents? I headed off to look for him in the 1871 England census. And there he was. On 15 February 1863, Henry had married Elizabeth Ann Byford at the Union Street Chapel in the district of Medway “according to the Rites and Ceremonies of the Bible Christians”.3 At the time of their marriage, they both resided in New Road, Chatham (Kent). Henry’s father is listed as “Richard Florey (deceased)” with an (obviously previous) occupation of labourer. And I couldn’t find a death record for his father Richard. Or a likely marriage for his parents. Ho hum. On FamilySearch, I found a baptism record for a Henry Richard Florey in Yalding in 1840.5 His mother is listed as Elizabeth Florey, but there is no father’s name given… and despite his birth being after compulsory registration, I can find no record of his birth in the GRO index on FreeBMD. Finally I got round to ordering Henry’s death certificate. He died on 27 May 1916 in Lepperton, Taranaki, New Zealand, and was buried in Lepperton Cemetery on 30 May 1916.6 New Zealand death certificates can be a gold mine of information, if the informant of the death knew enough about the deceased. Henry’s father is listed as ” — Florey” (grrrrrrr!). His mother is given as Elizabeth Ann Knott – so I now have a maiden name! On FamilySearch I found a marriage for a James Florey and Elizabeth Jane Knott in 1820 in Frindsbury, Kent. 7 Could this be the one? I then went searching for baptism records for Jane and William – and found Jane! Well, a likely candidate, at least: Jane Elizabeth Flora [sic], born 13 Dec 1824, baptised 02 Jan 1825 in St Margaret, Rochester, Kent.8 No sign of William. Or John. If the family in the 1841 census is Henry’s, could the older two children be James’s children? Had Elizabeth then had William and Henry with another man (or men?). Or is it more likely that James could be Henry’s father, and Henry got his dad’s name wrong when he married…? New Zealand, marriage certificate for Henry John Forrest Florey and Annie Horne; 10 Mar 1885, Auckland; citing 1885/65, Birth, Deaths & Marriages, New Zealand. “1871 England Census, Henry Florey (age 28) household, St Margaret, Rochester, Kent,” Ancestry.com, (http://www.ancestry.co.uk/, accessed 02 Mar 2010), citing PRO RG10/904, folio 29, p 16, GSU roll: 823489, Medway registration district, Rochester sub-registration district, ED 12, household 65, 2 Apr 1871.
. England, marriage certificate for Henry Richard Florey and Elizabeth Ann Byford; 15 Feb 1863, Medway, Kent, England; citing 1863 Mar [quarter] 02a [vol] 466 [page], General Register Office, Southport.
. “1841 England Census, Elizabeth Florey (age 37) household, Wateringbury, Kent,” Ancestry.com, http://www.ancestry.co.uk, accessed 02 Mar 2010, citing PRO Class: HO107; Piece 464; Book: 2; Folio: 22; Page: 6; Line: 21; GSU roll: 306859, Registration district: Malling, sub-registration district; East Peckham, ED 2, 06 Jun 1841.
. “England Births and Christenings, 1538-1975”, database, FamilySearch, (http://www.familysearch.org/, accessed 5 Nov 2010).
. New Zealand, death certificate for Henry Richard Florey; 27 May 1916, New Plymouth; citing 1916/4344, Birth, Deaths & Marriages, New Zealand.
. “England Marriages, 1538-1973”, database, FamilySearch, (http://www.familysearch.org, accessed 23 Nov 2010).
. “England Births and Christenings, 1538-1975”, database, FamilySearch, (http://www.familysearch.org/, accessed 30 Dec 2010).